High King Valkin has finished forging his Epic weapon, the dual blades Hugin and Munin! However, he's not ready for everyone to experience their awesome power just yet, so he's limiting it to those who help him and his Dwarven kin in the Dwarven Rune War! Hugin and Munin increase Valkin's Attack, Defense, and Health, and gives him a chance to do an attack for 2x damage, increase the defense of all allies (including himself), and add haste to all other allies. In addition, because Valkin is a legendary hero, he gets an improved passive: Epic Dwarven High King! This is an improvement on his Dwarven High King ability that gives all his allies +25% attack and defense, and Dwarf allies get DOUBLE the effect! 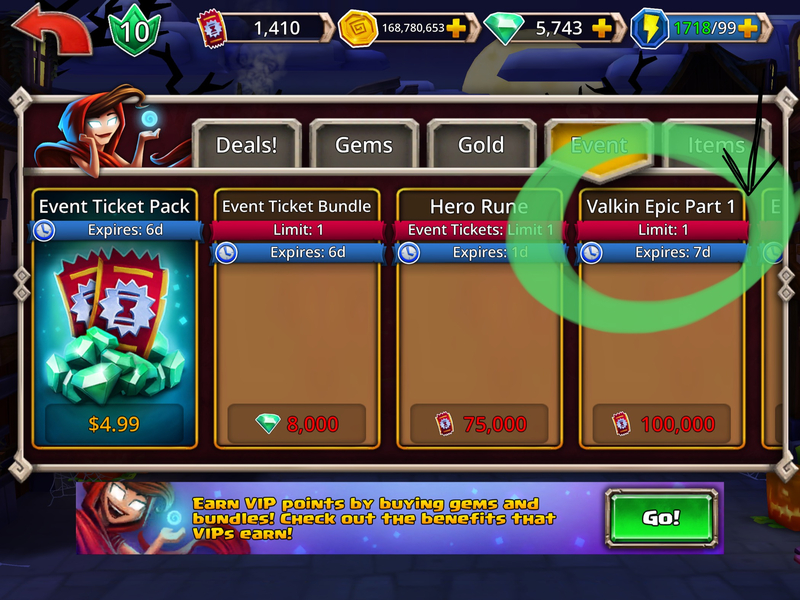 Valkin's Epic parts are currently ONLY available in the Dwarven Rune War event ticket shop. Hugin and Munin will be available on Boss Island at some point before the end of this month. Holy moley this will be so op! Could you please tell us what the stat boosts are as well? Thank you. Im confused. Is it a dwarven rune war or goblin rune war? Goblin. It's been a long day and Valkin's epic had me in a dwarven state of mind. So an epic that can only be purchased from the shop . What is wrong with you guys? If you wanna pay now to play with it, that's your choice. That’s so sad. I guess anything sounds good after all the rest of the garbage shoveled our way lately. I mean this is probably the most powerful epic we've gotten, so it makes sense why they madeit like this. This will likely be the standard for epic releases going forward. I’m a fan. No one will be able to max until the other epic pieces are available. You can skip the event if you want and wont miss out. This epic looks like one of the best we have had so far. I am probably going to have to wait for it on the island but ill try my best to get the tickets for it! 100,000 tickets for just the 1st part of an epic seems way to much to ask. I lament for the old weak heroes without any epic, they will be soon forgotten. On the other hand, I’m displeased by the fact that the already-op heroes keep on getting stronger and stronger. Cool. I'll remember to grind the ice place for this when it's free in a few months xD but impressive epic. Valkin will now be the most op hero in the game since Shade and he has a better rune slot setup instead of all dark slots. PartS or Part? The description in the event shop says Part 1. @NekoAtsume Purchasing that will allow you to unlock the Epic. Just to clarify, the second epic part is obtainable after you unlock the first. It will require another 100,000 tickets. What are the stats that Valkin's epic boosts? Def/attack/skill? At epic level 12 it's +30% atk +20% def and +20% health. Because he is so "underpowered"... err... legendary (don't tell Igorok or Bramble) he gets an Epic trait that boosts atk and def by +50% for all dwarfs, including Valkin, and +30% for other allies. Please can you describe felhorn? I have no hero of that name and I have all the heroes. I'm guessing the name is different in different languages. The hero's full name is hagrim felhorn. Like Yasmin bloom, Willow swift, etc. What an improvement. I remember all the complaints about running boss island dungeons time after time without an epic part drop. Now you can run any dungeon you want 2000 times and can be guaranteed to get the part. Even better, Valkin does not even have to be on your team. I'm thinking the same. I don't really want to spend the next week constantly playing just to get something that will be available to everyone later this month anyway. Maximum 3 weeks to wait. If it was 50,000 tickets for each part I might have tried for it.